Michelin-starred chef Gabe McMackin of the Finch has created this incredible dish featuring hyper-seasonal produce from Norwich Meadows Farm. 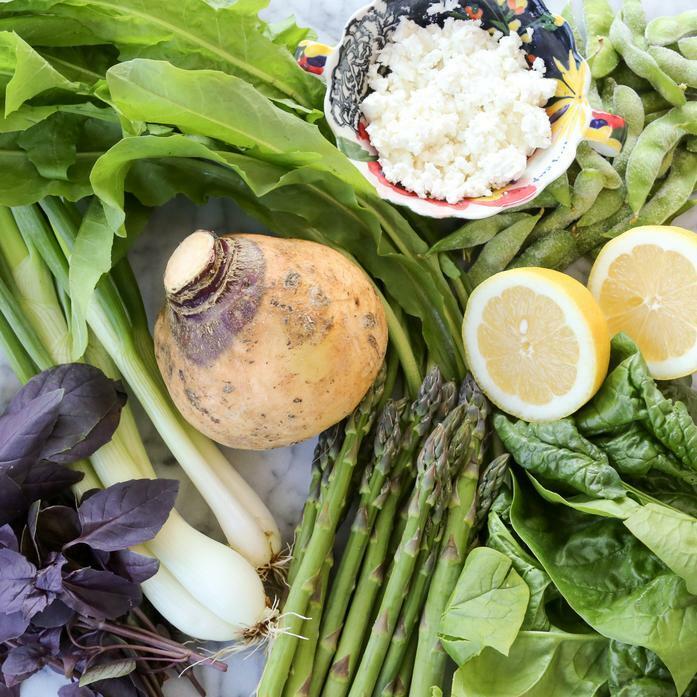 When cooked, the rutabaga has a mild flavor with the texture of pasta that is perfectly balanced by the sweetness of spinach and spring onion, the bitterness of the dandelion greens, and the tang of farmers cheese and lemon. Asparagus and edamame add some excellent texture and flavor to an already nutritious dish. This "salad" comfortably feeds four as a starter or two as an entree. Bring 5 quart pot of water to boil and add 1/2 tsp salt. Using a vegetable peeler, peel rutabaga. Slice thinly on a mandoline, then cut across into a fine julienne. Add rutabaga to boiling water for 30 seconds, drain, and shock in a bowl of iced water. In a 12 inch sauté pan over medium heat add 1 Tbsp olive oil and add spring onion whites (or bulbs) until soft. Add dandelion, asparagus, rutabaga, spring onion tops and edamame and cook for 30 to 1 minute, just to warm through. Add lemon zest and juice, salt and pepper. Pour everything into a serving bowl and add dollops of farmer cheese and torn basil.